A rendering for the proposed 27-storey Designers Walk building in Toronto. It’s part of an international movement in creating vertical urban forests. Toronto architects Brisbin Brook Beynon have designed plans for a ground-breaking tower featuring more than 450 urban trees. The difference between this building and others is that none of the trees will be potted. Instead, they will form a vertical forest, fusing the natural outdoors with indoor spaces. According to architect Brian Brisbin, “A vertical forest is really like a hillside. It’s not potted plants on a decorated building. The building is really a host, like a hillside”, he said. The proposed building will have over 450 trees, with irrigation, fertilizing and monitoring systems all built into the structure. Each tree will have its own computerised ID and will be monitored by an offsite control system. Sensors reading irrigation and nutrient levels will also be fitted, as its anticipated that each tree will have different needs, depending on where it’s situated. The building will be the first of its kind in Canada and is being planned for a plot next to Designers Walk – an area of offices for architects and designers at the intersection of the Annex and Yorkville Neighbourhoods. The development application is currently with the City of Toronto, and the innovative design has everyone talking. It draws on what people want to see (more trees than glass and steel) and what cities want to achieve (buildings that benefit the urban climate, rather than contribute to the heat-island effect). It also breaks down traditional barriers between nature and the built environment. “Twenty-five years ago, awareness of the heat-island effect, storm-water management and green roofs wasn’t that profound, because the consequences hadn’t quite been as clear,” Mr. Brisbin said. A traditional glass and steel condo does “absolutely zero for the heat-island effect of our cities. It’s doing nothing for the green canopy, oxygen, carbon dioxide. So our approach is literally nature and its relationship to an urban environment, and how it’s going to survive the heat-island effect and carbon footprint,” he added. The design also solves the complex problem of creating more tree canopies while contending with space and budget challenges. 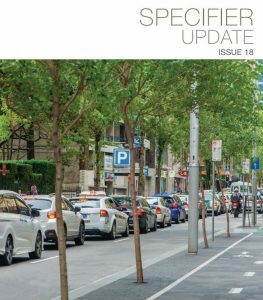 “You simply can’t increase the city’s canopy by 30 to 40 per cent [by planting trees] on the sidewalk. So, we have to look at a solution that’s vertical,” Mr. Brisbin said. 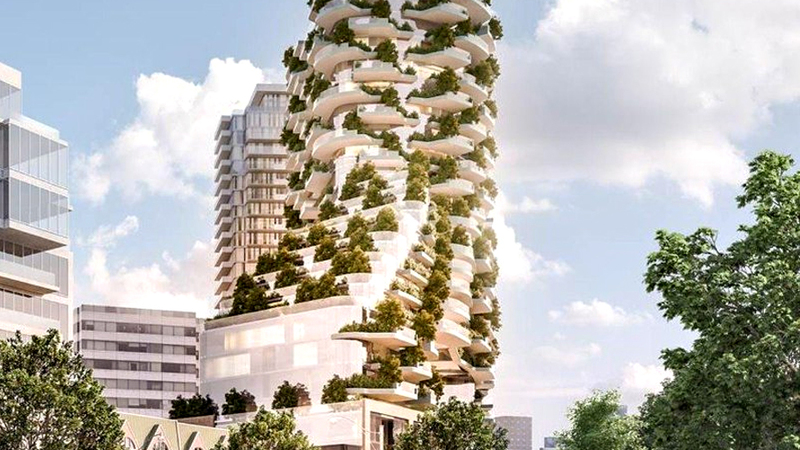 While the proposed building has clear aesthetic and environmental benefits for the City of Toronto, Mr Brisbin sees potential for something bigger – a new micro-industry of tree-clad technology that could be applied to other buildings. The developers for the proposed tower are Cityzen Development Group, who are best known for the head-turning “Marilyn Monroe” condo towers in Mississauga. This is going to be one to watch.